This film is a great favourite of mine – a beautifully made film using a top Director in Ken Annakin as well as photography by Guy Green, Set Design superbly done by Carmen Dillon right at the top of her game on this one, and Alex Bryce as Second Unit Director. Then to put the icing on the cake – Peter Ellenshaw for Matte Paintings which were just out of this world – and gave the film a story-book feel that it would never have achieved. On top of this the actors were all perfect for their roles. 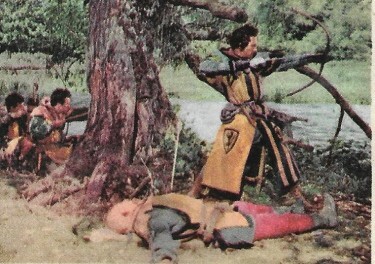 However in the process of the filming it would seem that some strands of the film were left out and others replaced by studio sets. 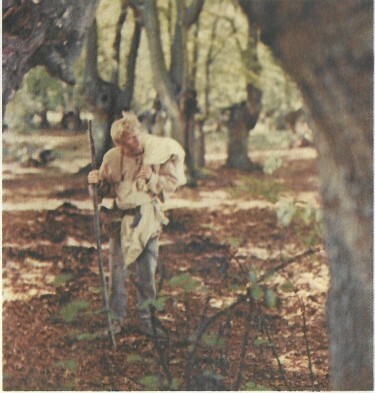 ABOVE – we see Elton Hayes as Alan a Dale with Joan Rice as Marian, walking through Sherwood Forest – which actually was Burnham Beeches. 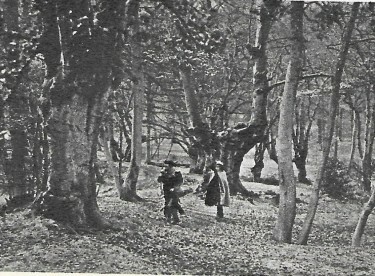 This scene was not in the film – instead they had the two of them walking through studio sets of the Forest at Denham Film Studios. 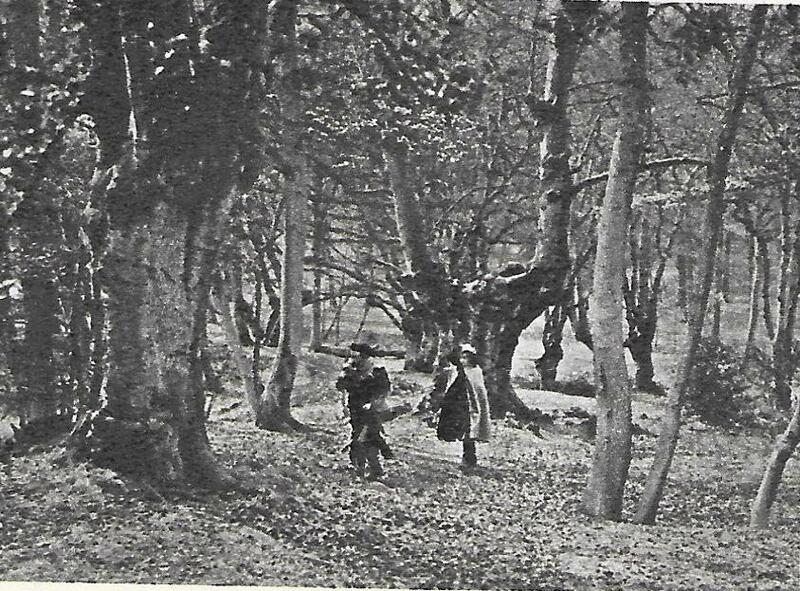 Behind them in this shot was Midge the Miller played by Hal Osmond – and here he is in a closer shot – taken at the same time in the same bit of Burnham Beeches – again this bit not seen in the film. 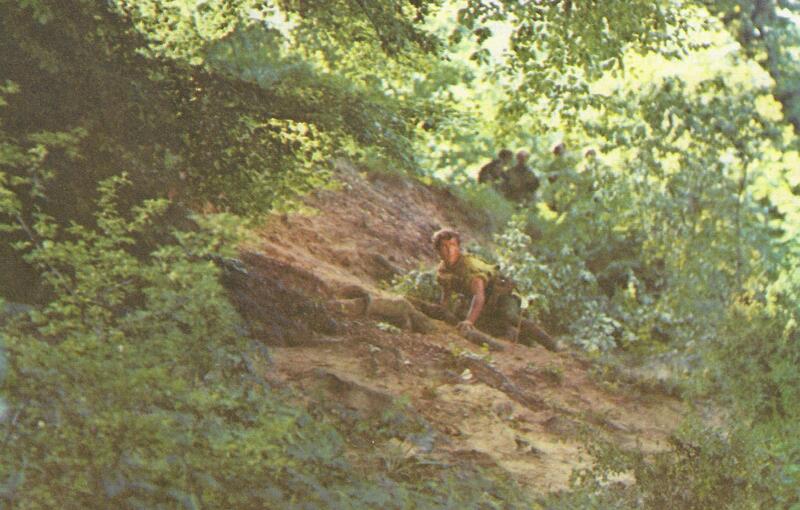 Here Richard Todd evades his pursuers arrows as he scrambles up the bank. This was used but not as the picture shows – this must have been just a still because we can see figures in the background at the top of the picture. However a dramatic looking scene which definitely did not make the film shows Peter Finch firing arrows back at the outlaws – how this was going to fit the film I just don’t know. 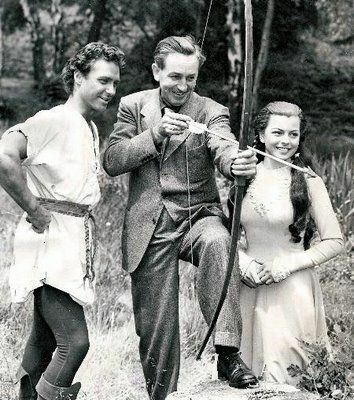 It seems though it might originally have been filmed and was part of the story – I am not sure on this one. The Technicolor on this was just about as good as it gets – really lovely and showed the Forest – both Burnham Beeches and the Denham Studio Sets – to great effect and looking stunning and fitting of any childhood imagination for this famous story. Love this post! 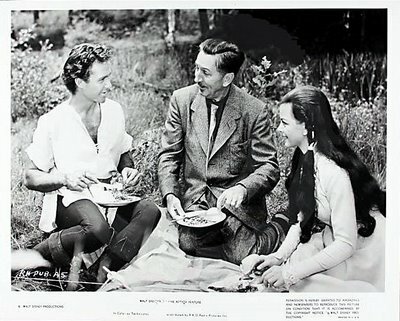 I have often wondered if some of the cuttings from the film exist in a vault somewhere. Would love to see them.